﻿"This was the most meaningful course I have ever taken." We first opened our doors in 1994 in Central Florida, and have grown to become a company recognized throughout the state of Florida as a pioneer in continuing education for medical professionals of all levels, from EMTs to medical doctors. We offer premiere instruction for organizations as well as individuals in a wide variety of specialties, from Standard First Aid Courses to Neonatal Resuscitation to Flight Physiology. We teach BLS, NRP, PALS, ACLS, ITLS, and Standard First Aid to name a few. All our classes are offered "stress-free", and are approved through their respective course sponsors. We also have over 20 courses available completely online. When you have successfully completed an online program, you receive and can print your certificate immediately upon completion. No more waiting for your certificate to arrive in the mail! Contact hours (CEUs) for online courses given through the Florida Board of Nursing. For more information, please use our online courses menu. 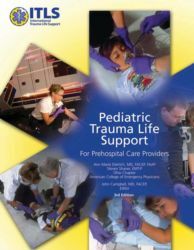 The 3rd edition of the Pediatric ITLS textbook is a companion to the 6th edition ITLS for Prehospital Care Providers manual and reflects the same ITLS method of assessment and management, but with an emphasis on the special needs of the pediatric trauma patient. In addition, the text highlights techniques for communicating with young patients and their parents. The eBook version of the Instructor manual for the Basic Life Support (BLS) course. Provides lesson maps and information for teaching the classroom-based and blended-learning options for the Basic Life Support (BLS) course on an initial or a renewal basis, including 40 lesson plans for the classroom-based format and 40 lesson plans for the blended-learning format, plus electronic access to supplementary information and tools. Each Instructor must have his or her own eBook. Based on the 2015 American Heart Association Guidelines for CPR and ECC. PC, Mac®, and iOS compatible. The access code and instructions on how to access the eBook will be e-mailed to you, usually within 2 business days. NOTE: This product is not eligible for refund. This convenient package contains materials for teaching the classroom-based and blended-learning options for the Pediatric Advanced Life Support (PALS) course: 1 copy of the PALS Instructor Manual, 1 copy of the PALS Provider Manual, 2 copies of the PALS DVD Set, 1 set of PALS Emergency Crash Cart Cards, and the PALS Poster Set (shipped folded). All components are also sold separately. Based on the 2015 American Heart Association Guidelines for CPR and ECC.